During the period when the town’s fortunes were rising the Washington, Baltimore and Annapolis Electric Railway Company business was on the decline, and WB&A ceased passenger service in 1935.12 Access to the District of Columbia and other employment centers was facilitated a decade later when the Washington, Marlboro, and Annapolis Motor Lines, Inc., began offering bus service between Glenarden and Seat Pleasant.13 By 1950, the WB&A right-of-way had been converted into Maryland Route 704, the George N. Palmer Highway. That year, the population of Glenarden and Glenarden Heights totaled 491.14 Palmer Highway was renamed the Martin Luther King Jr. Highway in 1986. In the 1950s and 1960s, the population of Glenarden grew due to annexation of Glenarden Woods, Glenarden Apartments, and Tyrol Estates.21 In 1961, the population totaled 1,336.22 While Glenarden had grown, by the 1960s, its older housing stock was deteriorating. In 1963, the Glenarden Housing Authority constructed a 90-unit public housing project with the assistance of federal funds.23 In 1964, the construction of I-495, the Capital Beltway, resulted in the removal of all houses on Sixth Street and on the east side of Fifth Street.24 The semicircular streets around the Glenarden railway stop were removed c. 1965 for construction of a municipal center that replaced the first town hall.25 St. Joseph Catholic Church moved from its original location in Ardwick Park in 1967.26 The community underwent a further transformation in the mid-1970s, when the town received a HUD Community Development Block Grant.27 As many as 600 households were scheduled for relocation in the 1960s and 1970s, with much of older housing replaced with public housing.28 Municipal projects completed in 1978 with the assistance of HUD funds included an expansion of the municipal center and the construction of a local branch of the county library system; both projects were designed by Glenarden resident, architect Anthony Johns.29 In the final decades of the twentieth century, the population and area of Glenarden continued to grow with the assistance of further annexation. The Washington Commerce Center and Carrollton Station subdivision were annexed in 1983. In 1985, Glenarden annexed the 245-acre Royal Gons tract on its eastern boundary. In summer 2008, construction was under way on a $500-million mixed-use development on the Gons site. 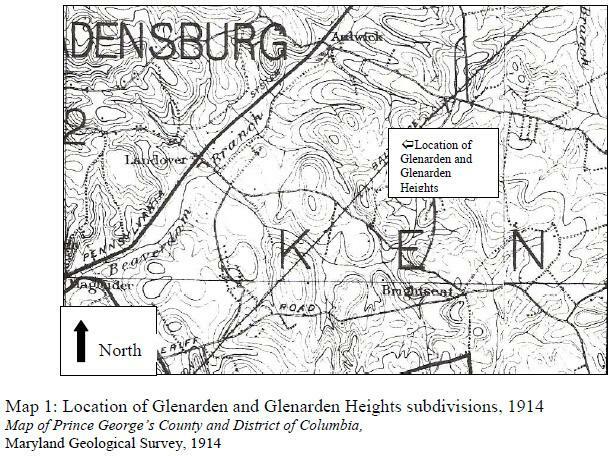 The development of Glenarden can be traced in a series of historic maps. The 1914 topographic map shows the route of the Washington, Baltimore and Annapolis Electric Railway, but the new subdivision is not named (Map 1). A map in the Prince George’s County Atlas published in 1938 shows the railroad line and a number of dwellings concentrated along Glenarden Parkway in Glenarden and Lincoln Avenue in Glenarden Heights, and a few in Ardwick Park near St. Joseph’s and on Piedmont Avenue (Map 2). The 1950 highway map shows the incorporated Town of Glenarden (with gravel-surfaced roads) bordered on the west by the George N. Palmer Highway, now located in the earlier railroad right-of-way. A 1961 Glenarden map shows the streets within the town boundaries 50 years after the community was originally platted (Map 3). 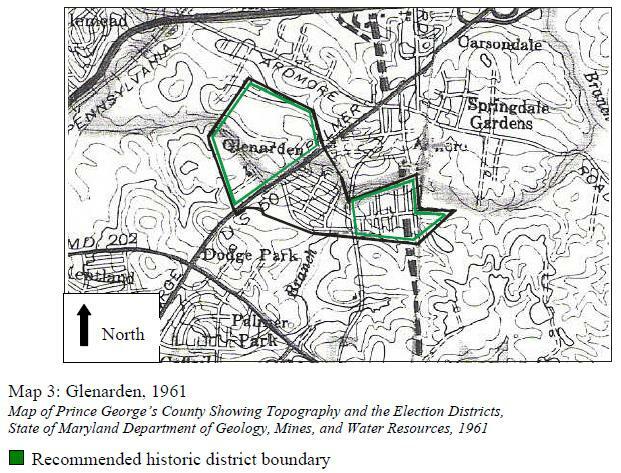 Denny, George D., “City of Glenarden,” in Proud Past, Promising Future: Cities and Towns in Prince George’s County, Maryland Brentwood, MD: George D. Denny Jr., 1997. Few buildings from the first decade of development stand in the community. The earliest buildings are dwellings dating from the 1920s, and are either in the modest, vernacular with Colonial Revival characteristics (Photo 1) or bungalows (Photos 2, 6, 8, 9). Other residential building forms in the community include minimal traditional, Cape Cod (Photos 7, 12, 13), ranch, and split-level. The houses display a variety of cladding materials including brick, concrete block, and aluminum and vinyl siding, with some facades containing a mix of two materials. The houses east of Brightseat Road are larger than those on the west. Many of the smaller houses have been expanded with additions. A majority of the houses in the Town of Glenarden were constructed after the mid-1960s. Glenarden Woods Elementary School is located in the northwestern section of the community, as is the Martin Luther King Jr. Community Center. The James R. Cousins Jr. Municipal Center and U.S. Post Office are located on the east side of Martin Luther King Jr. Highway in the center section of town. Nearby, in a park setting, is the Glenarden Community Center. The Glenarden Branch of the Prince George’s County Memorial Library is located on the east side of Brightseat Road at Glenarden Parkway, also in the center section of town. St. Joseph Catholic Church is located just east of the community boundary on Saint Joseph’s Drive in Largo. The few commercial buildings in the community are located on Martin Luther King Jr. Highway. Today, the Town of Glenarden lacks the physical continuity of the original twentiethcentury subdivisions and a consistent sense of community. This is largely due to the incursion of two major north-south thoroughfares, the demolition of older housing stock in the 1960s and 1970s, expansion through annexation of adjacent subdivisions, and alterations to the original plan caused by modern construction projects. Glenarden does retain a strong physical boundary, with the borders marked by woods and few through streets spanning the city limits. There is a greater sense of community in the western section of the city, known as Glenarden Woods. In this area, no major roads cut through the site and the higher terrain screens the Martin Luther King Jr. Highway from the residential neighborhoods. Glenarden represents three Prince George’s County Heritage Themes including “railroads”, “African-American history”, and “suburban growth.” Glenarden meets the following criteria for designation as a Prince George’s County Historic District: (1)(A)(i) and (1)(A)(iv) – Glenarden is significant as an early twentieth century suburban development established as a result of the creation of the Washington, Baltimore and Annapolis Electric Railroad in 1908. The community was marketed to African- Americans, and the first group of residents comprised both skilled and unskilled workers largely employed by either the federal government or the railroads. As a result of the efforts of the Glenarden Civic Association, Glenarden was incorporated in 1939 as the third African-American municipality in Prince George’s County. While the purpose of the present document is not to evaluate Glenarden for National Register status, a National Register of Historic Places Multiple Property Documentation Form completed in 2003 can be useful in evaluating the community for Prince George’s County Historic District status.31 The documentation form makes the case that, because of the alteration and reuse of buildings due to segregation and the ability of buildings and structures to “document the dynamic of social and political change,” instead of strictly adhering to stands of architectural integrity in evaluating African-American resources, “integrity requirements should focus on aspects most closely linked with the associative and interpretive values of these resources.”32 Therefore, evaluating the integrity of Glenarden as a local historic district requires a judgment whether the town retains enough of the physical fabric from the historic period to communicate Prince George’s County historic themes. 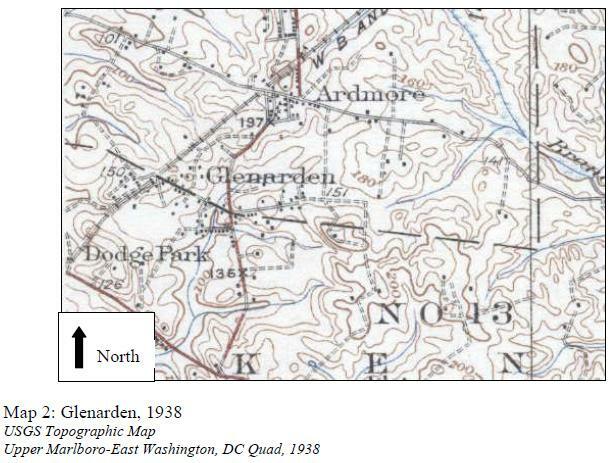 In addition to the Town of Glenarden, the subdivisions of Glenarden Woods and Glenarden Heights may be eligible for designation as local historic districts according to Prince George’s County criteria (1)(A)(i) and (1)(A)(iv): Glenarden Heights and Glenarden Woods represent the continuum of progress and development in the county’s African-American communities from 1911 through the 1950s. Glenarden Heights spans the entire period and contains the original Glenarden Town Hall constructed in 1943 and small houses and cottages constructed in the 1920s through 1960s. In the northwestern part of Glenarden, Glenarden Woods is representative of the latter part of the historic period, when suburban development was fueled by the automobile. The community contains the Glenarden Wood Elementary School constructed in 1957 and modest dwellings constructed in the 1950s and 1960s. Alterations and additions to original dwellings do not detract from the communities’ historic character; Glenarden Woods and 30 Darsie, Ibid. 31 Betty Bird and Associates, “African-American Resources in Prince George’s County, Maryland,” National Register of Historic Places, Multiple Property Documentation Form, October 2003 32 Bird, Multiple Property Documentation Form, E-4 Glenarden Heights retain their historic location and association. 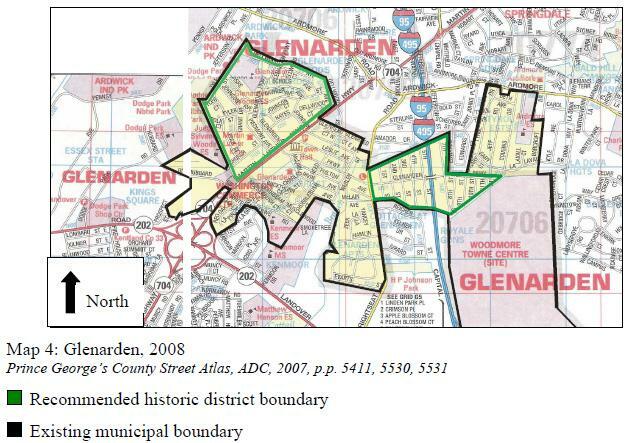 The subdivisions of Glenarden Woods and Glenarden Heights possess a relatively moderate level of integrity (Map 4). The loss of setting is due to the alteration of the larger context of the Town of Glenarden during the urban renewal projects of the 1970s and 1980s. 8 Susan G. Pearl, Glenarden. 10 Susan G. Pearl, Glenarden. 11 Susan G. Pearl, Glenarden.